Energy Storage Systems Inc. manufactures cost-effective, reliable and environmentally friendly iron flow batteries for large scale energy storage. Before coming to Anvil Media, ESS Inc. had done very little to zero marketing for their products and brand. This led to difficulties for the company’s sales team, who were attempting to generate leads from consumers with no familiarity of ESS Inc. and their energy storage products. Anvil was given the task of increasing awareness and leads for ESS Inc. with a paid campaign with limited budget. Anvil refined the focus of keyword targeting with negative keywords and a granular campaign structure. Anvil refreshed their ads to be more targeted, improving their quality score while also testing out different landing pages to increase conversion rates. Anvil Media was able to stretch ESS Inc.’s limited budget to increase Search Impression Share from 24.5% in March to nearly 53% in July – a 115% increase that put their brand in front of a larger percentage of qualified search users. From March to July, Anvil Media improved the conversion rate of ESS Inc.’s Battery Product and Brand Awareness campaigns 595%, while increasing their volume of leads by 400%. 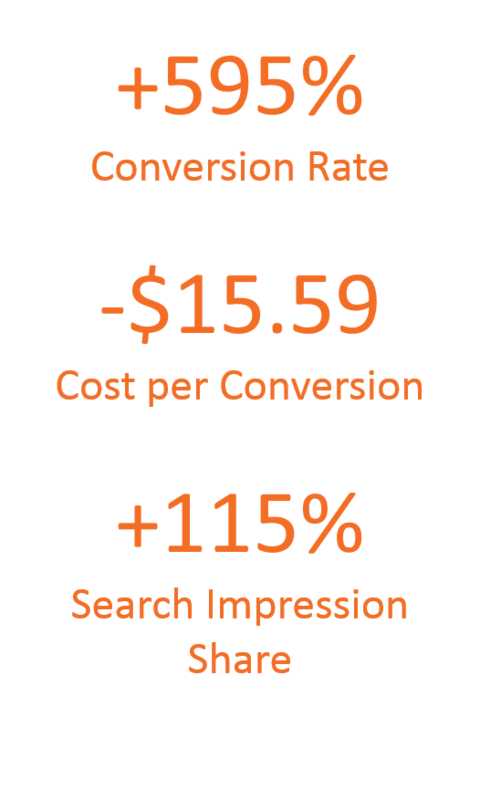 During this same period, Anvil Media was able to drive cost per conversion down 68%, from $22.79 to $7.20 – the lowest rate ESS Inc. has received since launching their paid media campaigns in December, 2016.